Rabies Clinic for Lee County, Saturday May 4th, 11th, 18th. 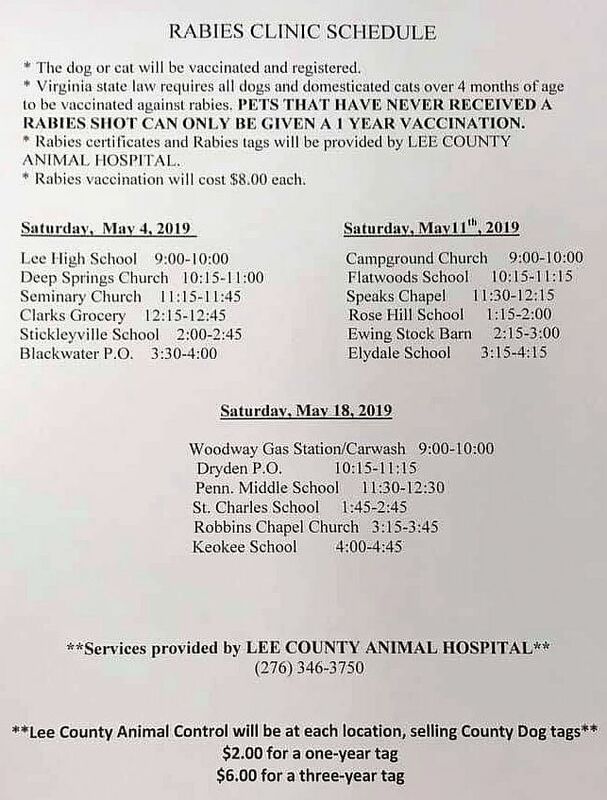 Lee County Animal Hospital and Animal Control will be at these locations. Times are approximate. Due to larger turn outs at some locations we are sometimes running behind. State law requires that all dogs and cats be vaccinated for Rabies. Click here to see locations and times. Lee County Animal Pound is a small rural facility in the southwest of Virginia. While Lee County Animal Pound is not yet a no-kill facility, this is a goal we strive to achieve each and every day. For more information see the Lee County Animal Control website. The pet in the photo (top right) is looking for a home. Click on the picture for more information about it. We do not respond to Facebook posts. We appreciate everyone who shares our posts and helps with trying to find homes for the lost furbabies in our facility. We only have two officers for entire county and are responsible for the cleaning and care of the shelter as well. We do not have a secretary or shelter staff. We are in the office (unless there is an emergency) from 8am-10am Mon-Sat and we try to leave a message on the answering machine if we are not going to be available at shelter during these times. We are more than happy to meet with you at different times by appointment. Emergency and cruelty cases for both domestic and agriculture animals and dangerous animal calls. If you want to surrender your dog to Lee County, we strongly encourage you to bring it to the facility between 8am-10am Mon-Sat. We receive 30-40 calls per week about missing dogs and we see a lot of posts on Facebook from people finding dogs and trying to give them away or saying they rescued them. Animal Control MUST be notified of 'found dogs' according to code of Virginia. Not all animals that are running loose are strays, although they are required to have tags and collars, most people still do not put them on their animals. Stray dogs without collar are kept for 7 days before being put up for adoption. Dogs with a collar are kept for 12 days before being put up for adoption. Contact the shelter to check whether your pet is there. Some of the stray dogs are featured on the Lee County Virginia Control Facebook Page but not all are put here so contact the shelter if you have lost your dog. Adoptions are free to the public, however, you must sign an Adoption Agreement, and a Spay/Neuter Agreement stating that you will have the animal spayed or neutered within a certain period depending on the age of the animal. Please remember before animals are ready for adoption a holding period is required per state law. Stray dogs with a collar is 12 days starting the day of custody. Stray dogs WITHOUT a collar is 7 days starting the day of custody. Owner surrender dogs DO NOT have a holding period. Out of state adoptions must be spayed or neutered before leaving the state. There are no fees associated with adoption. If you find a stray dog, you have no specific duty to take the dog to the pound. 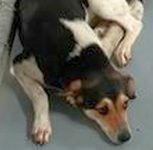 Each county and city in Virginia has to have an animal control officer, and you are certainly within your rights to contact animal control to report the stray. See our opening times above. Notify the local pound where the animal was found, and provide the pound with your name and phone number, the location where you found the animal, and a description of the animal along with any information from a tag, license, collar, tattoo or other form of identification or markings. You can find helpful tips and guidance about stray animals from the Humane Society of the United States. The most important consideration is safety - yours and the animal's. Remember that the animal will likely be fearful, and may be sick or injured. Be particularly careful if you find the animal in an area with traffic. Be aware that if you take in the stray, you take on the duty to provide the animal with adequate care. This includes the duty to provide veterinary care, so be prepared to pay the vet bills if the stray is injured or sick. The second most important consideration is to think lost, not stray, and do all you can to get the animal back to its owner. It is for this very reason that a violation of Section 3.2-6551 carries a civil penalty of up to $50 per animal. Try putting a long lead on a dog and telling him to go home to see if the animal knows its way home, hang large 'Found Dog' posters in the area where you found the dog, and take the animal to animal control or a vet to see if the animal has a microchip that will identify the owner. For more information see the Best Friends webpage. When looking for that new family member please remember to really think about the things you and your family want and need in a pet that fits the family lifestyle. Get to know your breeds! Some breeds require more space, exercise and circumstances than others. Even if you are going to adopt a mixed breed, look into what it's primary breed needs in a home, environment and exercise. 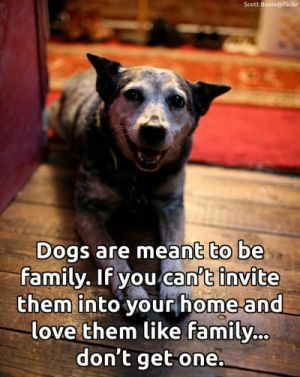 Your new family member needs to be wanted by everyone in the family and included in your daily lives to be truly happy. Click here for more information on how to find the right dog. We need towels, blankets, hard and soft dog food, basic cleaning supplies and dog beds or you may mail a donation to Lee County Animal Pound, Bus Shop Road, Jonesville, VA, 24263. On behalf of the dogs thank you. Toys that make a noise when you squeeze them can encourage some dogs to be aggressive towards young children because they squeek too. The device that makes the noise is usually small and can be harmful if swallowed. Some toys of this type contain a small battery which is poisonous if the dog eats it. The best toys are tuggers, tennis balls and hard chew toys that cannot be ripped apart. Location Map of Jonesville, VA.
View our dogs available for adoption.